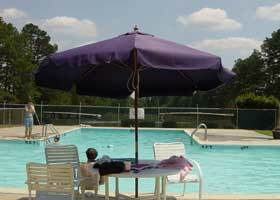 The pool opens in June and closes Labor Day. Ladies water aerobics class offered. American Red Cross aquatic programs offered in July — toddler, preschool, beginner swim lessons. Pool is available for rent for private pool parties.